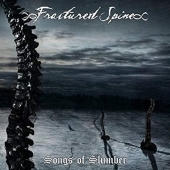 "Songs of Slumber," by Finnish rockers Fractured Spine, is a chilly, unforgettable atmospheric journey. I've had this album on my desk for a long while and I've attempted to review it time and time again. But that's not an easy task. "Songs of Slumber" is such a unique album, such a unique sound, that it's difficult to put it into words. Let's just say that it seems to be set in a cold, desolate world (not just based on the album cover, but the music's icy style). Then you add knife-blade guitars, double-tap drums, an effective combination of clean/not clean vocals, with spooky piano and David Lynch-style sound effects here and there. Yeah. That's about it. But it's some amazing stuff and it will keep you riveted from beginning to end. It's weird, it's wild, it's uber-atmospheric but "Songs of Slumber" will not do the thing the title indicates: It will do anything but put you to sleep. For more information, check out http://www.fracturedspine.net.